And they are very interrelated. Energy is something we all need, but we are consuming it in a manner that destroys the one thing which is more important, the environment. Religion is something that 95% (I guess, haven’t counted) of people seem to need but some of them are “consuming” it in a way that destroys those around them. 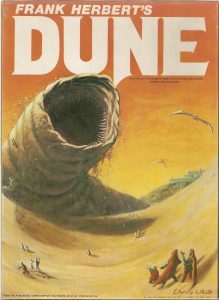 Dune is the most interesting book that I’ve read as a teenager because it deals with those three issues, at a level of great complexity while it remains an entertaining story for a teenager. It subverts genres that were not even defined so narrowly back then. Most call it sci-fi, then some say it is closer to fantasy, and others look at a mirror of 20th and 21st century world politics. Despite dealing with all of the above, Dune does something even more important. It acknowledges that no matter the galaxy, or the century, or the name of each tribe, a hero is always on a journey where human spirit fights hatred and love fights against darkness. And the greatest the victory, the greatest the price to pay. This is the #1 rule I have in writing. Depriving 50,000 readers of a few quality hours of their lives with bad writing is equivalent to sucking a human life. I am doing my best to remain innocent.